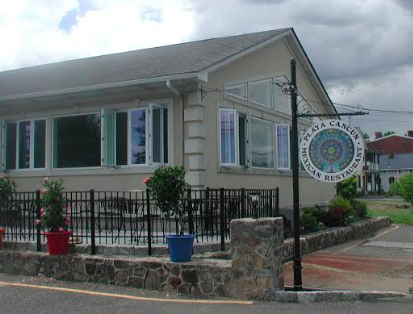 As I was formulating my plans for the next installment of this series I was given the suggestion to take a look at a new place in Stony Point named, “Playa Cancun”. Not being very familiar with Mexican fare it would be a change of pace, but then I am not afraid of some spice either so I took the plunge. It is located on the river road along the Grassy Point sea wall opposite the town from Stony Point river front park. That location has had many incarnations which in my memory goes all the way back to Brophy’s. Upon entering the first thing I noticed was the cleanliness of the place which includes the restroom facility which should be a main point of interest because it is a reflection on the overall cleanliness I have found. On the subject of amicability for family dining be advised that the bar is in another room and this also makes for a peaceful time. I chose a seat overlooking the river which is a million dollar view. I could find peace and quiet just sitting there looking out at the boating while sipping on a drink. It was very restful. A basket of taco chips and bowl of salsa was there immediately and were very crisp and tasty. I ordered my usual seltzer and lemon wedge and perused the menu for something interesting. For appetizer I chose the plate of nachos covered in melted cheese (mozzarella I think it was judging by the taste and consistency) with guacamole on the side. I hadn’t finished my chips and salsa when it arrived and it was really very good in every respect. It was arranged like a mini pizza of tacos and cheese with plenty of guacamole and sour cream (which I seldom imbibe in since losing 50 pounds some 17 years ago). I enjoyed the dish in short order then finished off my chips and salsa. While ordering and becoming familiar with the staff I asked if the place was indeed owned by Manny who was formerly of Fiesta Cancun in town and indeed it was. Moment alter Manny was brought in and introduced himself and I thanked him for having such a nice place. Then came my main course which was fajitas with shrimp. I was told that I could have chicken and beef mixed in but I chose all shrimp as I can get chicken and beef anywhere but I never met a shrimp I never liked. This too was excellent and came sizzling. What must be noted is that the spice was not extreme but moderate which is what most American palates are accustomed to. The entire meal came to $27.34. The view alone is a selling point and the food and courteous service add up to a very nice dining experience.